God of mercy, you inspired Saint Clare wiht the love of poverty. By the help of her prayers may we follow Christ in poverty of spirit and come to the joyful vision of your glory in the kingdom of heaven. We ask this through our Lord Jesus Christ, your Son, who lives and reigns with you and the Holy Spirit, one God, for ever and ever. Amen. St. Clare of Assisi was the first woman to practise the life of entire poverty as taught by St. Francis. Placed by him at the head of a few companions in the small convent of San Damiano, she governed her community for forty-two years thus founding at the gates of Assisi the Order of Poor Clares. Their Rule included austerities hitherto unknown in monasteries of women. They went barefoot, slept on the ground, kept perpetual abstinence and made poverty the basis of their lives. St. Clare died on August 11, 1253, and was canonized two years after her death. Before the reform of the General Roman Calendar today was the feast of Sts. Tiburtius and Susanna. St. Tiburtius is a Roman martyr of unknown date who is buried on the Via Laviacana in the cemetery known nowadays as the catacomb of Sts. Peter and Marcellinus. 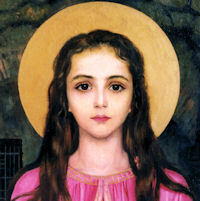 St. Susanna, a Roman virgin, was also martyred at an unknown date. There are two churches in Rome which bear her name. The feast of St. Clare previously was celebrated on August 12. The Breviary says of her: "Following the example of St. Francis, she distributed all her possessions among the poor. She fled from the noise of the world and betook herself to a country chapel, where St. Francis himself sheared off her hair and clothed her with a penitential garb (on March 18, 1212, at the age of eighteen). Then she resided at the Church of St. Damian, where the Lord provided for her a goodly number of companions. So she established a community of nuns and acted as their superior at the wish of St Francis. For forty-two years she directed the nunnery with zeal and prudence, her own life serving as a constant sermon for her sisters to emulate. Of Pope Innocent IV she requested the privilege that she and her community live in absolute poverty. She was a most perfect follower of St. Francis of Assisi. "When the Saracens were besieging Assisi and were preparing to attack the convent, St. Clare asked to be assisted as far as the entrance, for she was ill. In her hand she carried a vessel containing the blessed Eucharist as she prayed: O Lord, do not deliver over to beasts the souls that praise You! (Ps. 73). Protect Your servants, for You have redeemed them by Your precious Blood. And in the midst of that prayer a voice was heard, saying: Always will I protect you ! The Saracens took to flight." Clare was the first flower in the garden of the Poor Man of Assisi. Poor in earthly goods, but rich in her utter poverty, she was a replica of Jesus, poor in the crib and on the Cross. At her time the Church generally and many Church men were enmeshed in financial matters and political maneuvering. Through the renewal of the ideal of poverty, St. Francis effected a "reform of Christian life in head and members." In our twentieth century there still remain large areas with millions suffering under extreme poverty. Poverty in itself is no virtue; but it should be made into a virtue. Let us recall a few of the examples and texts from holy Scripture which show how precious poverty is and what deep reverence we should have toward it. Christ was poor. His entrance into the world and His departure from it took place in circumstances of greatest need. He had no house wherein to be born, no crib; no house wherein to die, no deathbed. Poverty stood watch at birth and remained to see His death. "The foxes have dens and the birds of the air have nests; but the Son of Man has nowhere to lay His head" (Matt. 3:20). At least we can be moderate and frugal, and thereby find the way to the spirit of Christian poverty. St. Clare, help us. Patron: Embroiderers; eye disease; eyes; gilders; goldsmiths; gold workers; good weather; laundry workers; needle workers; Santa Clara Indian Pueblo; telegraphs; telephones; television; television writers. Symbols: Chalice and host; tall cross; Monstrance; lily; ciborium. Often Portrayed as: Woman with a monstrance in her hand; Nun holding a vessel containing the holy Eucharist. 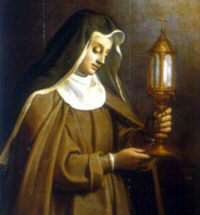 While St. Clare is the patroness of sore eyes, she has also become the patroness of television. She miraculously saw and heard Mass, even when she was too sick to attend! Make a resolution to prevent sore eyes caused by too much television! Pick shows selectively. Some families create a token system, rationing viewing by requiring viewers to "PAY-PER-VIEW". Buttons, poker chips or other sets of small game pieces can be used as tokens (handed out weekly), or a TIME SHEET can be used to log in or out TV programs to keep track. Help children to choose programs carefully. Help children to recognize how programs which may be cute or funny, do not necessarily reflect family values. Keep the dialogue going and talk about the differences! /* */ or see Arma Dei for more information about this great book. Treasure Chest is filled with unique ideas for activities, crafts and recipes to help families celebrate the various Seasons and Feast Days of the year. A sense of reverential awe and deep respect fills us whenever we meet the martyrs of the ancient Church. Yet it is often very difficult to give a strictly historical account of their lives. Nevertheless, even though we do not know all the biographical details, they are for us representatives of that "army of light," the martyrs, witnesses to Christ. And we want to be inspired by their example. Today the Martyrology tells this: "At Rome, between the two laurel trees, the death of the holy martyr Tiburtius. During the persecution of Diocletian the magistrate Fabian forced him to tread barefoot upon burning coals. As it only served to make him profess the faith more boldly, he was ordered to be led outside the city until the third milestone and there beheaded. . . . At Rome, the holy virgin Susanna. She came from an illustrious family, and was the niece of the saintly Pope Cams. At the time of Diocletian she won the palm of martyrdom by being beheaded." Symbols: Susanna Crown at her feet; sword. On May 25, 1802, excavators in the ancient Catacomb of St. Priscilla in Rome came upon a well-preserved shelf tomb sealed with terra-cotta slabs in the manner usually reserved for nobility or great martyrs. The tomb was marked with three tiles, inscribed with the following confusing words: LUMENA / PAXTE / CUMFI. However, if one places the first tile last and separates the words properly, the very intelligible sentence emerges: "Pax tecum, Filumena", which is, "Peace be with you, Philomena" Also inscribed on the tiles were symbols: a lily, arrows, an anchor and a lance, which would appear to indicate virginity and martyrdom. Inside the coffin there were discovered the remains of a girl of about twelve or thirteen years of age, along with a vial or ampulla of her dried blood. Transferred to the Treasury of the Rare Collection of Christian Antiquity in the Vatican, the remains were soon forgotten by the public, especially since no record existed of a virgin martyr named Philomena. But in 1805, a Neapolitan priest, Don Francesco di Lucia, traveling to Rome with his newly appointed bishop, requested and, after a brief delay, received the relics of this martyr "Philomena" to enshrine in his village church at Mugnano, near Naples. Immediately upon the official donation of St. Philomena’s sacred remains, signal favors began to be granted through her intercession and unusual events to occur. The favors, graces and even miracles started to increase, even before her enshrinement at Mugnano, and they steadily grew in number thereafter-such that this virgin martyr soon earned the title, "Philomena, Powerful with God." In 1837, only 35 years after her exhumation, Pope Gregory XVI elevated this "Wonder-Worker of the Nineteenth Century" to sainthood. In an act unprecedented in the history of Catholicism, she became the only person recognized by the Church as a Saint solely on the basis of her powerful intercession, since nothing historical was known of her except her name and the evidence of her martyrdom. But truly, as her devotees have discovered, no case, of whatever matter is too trivial or too unimportant to concern her. Among her most devoted clients was St. John Vianney (the Cure D'Ars) whose childlike devotion to this virgin Saint played an intimate part in his daily life. Other Saints who were always devoted to her, prayed to her and sang her praises were : St. Peter Julian Eymard, St.Peter Chanel, St. Anthony Mary Claret, St. Madelaine Sophie Barat, St. Euphrasia Pelletier, St. Frances Xavier Cabrini, St. John Nepomucene Neumann, Blessed Anna Maria Taigi and Ven. Pauline Jaricot. A number of Popes have also shown remarkable devotion to Philomena as well: Pope Leo XII (1823-1829) expressed the great admiration for this unknown child-saint and gladly gave his permission for the erection of altars and churches in her honor. Pope Gregory XVI (1831-1846), who authorized her public veneration showed his esteem and devotion to the Saint by giving her the title of "Patroness of the Living Rosary." A Mass and proper Office in her honor were approved by him in 1834 or 1835. This is extraordinary privilege granted to comparatively few Saints. Pope Pius IX (1846-1878) proclaimed her "Patroness of the Children of Mary." Pope Leo XIII (1878-1903) made two pilgrimages to her shrine before his election to the papacy. After he had become the Vicar of Christ, he gave a valuable cross to the sanctuary He approved the Confraternity of St. Philomena and later raised it to an Arch-confraternity (which is still headquartered at her shrine at Mugnano, Italy). Pope St. Pius X (1903-1914) spoke warmly of her and manifested his devotion to her in various ways. Costly gifts were given by him to her shrine. Excerpted from TAN Books and Publishers, Inc.
For more information on St. Philomena visit the following sites: Story of St. Philomena, Roman Catholic Sacramentals, the National Shrine of St. Philomena and Cleveland Catholics.